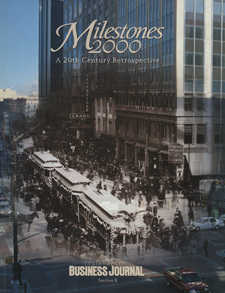 Like many organizations, the Indianapolis Business Journal looked at the millennium as a time to look back on the history of our city. It includes not only more business information than any other millennium publication on central Indiana, but also significant people and events in the areas of religion, sports, education, social services and the arts. It is approached decade-by-decade, including a narrative of key events, a time line, and a section about the most important people in the decade. Local companies were invited to purchase space after each decade to tell their own stories of when and how they began, and how they fit into the community. About the cover: this photograph melds a 1904 black and white photograph looking north at the intersection of Pennsylvania and Market streets with a picture from the same spot in 1999. This cover tells the whole story: from the first step of the 20th century to the last.